With three major migration corridors and more than 390 species in the province, Manitoba is a birder’s paradise. The province’s diverse landscape-grasslands, wetlands, sub-arctic and Boreal forest areas-attract a diverse crowd of birds. Spring migration has started so keep your eyes to the skies to spot your favourite species. Even in early April, Southern Manitoba can still feel like it’s shaking winter’s grip. 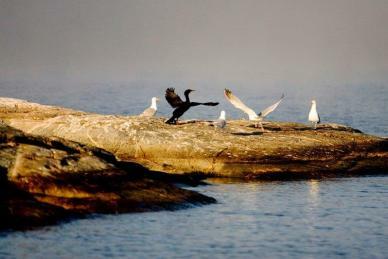 But that doesn’t keep the birds, or the province’s enthusiastic flock of birders away. 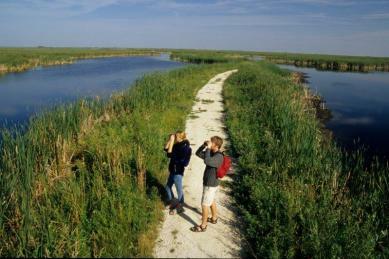 April is prime birding season as a flood of migrants from passerines to raptors and waterfowl pass through the region. Snow covered prairies, woods, still-frozen marshes and frost-covered hillsides are prime territory for bird spotting, especially in southern Manitoba. Keep eyes peeled for sharp-shinned hawk and Cooper’s hawk, both species of which have been spotted in spring, despite not spending the winter in Manitoba. Gray morph gyrfalcon make appearances around Brandon, two hours west of Winnipeg. Northern hawk owls also make Manitoba home and if you’re lucky, you might spy a Northern saw-whet owl. Red-bellied woodpeckers are a more common sight in southern Manitoba too. Manitoba birding “hotspot” Churchill comes alive every June with the return of thousands of snow geese. Birding experts guide watchers to prime spotting spots on this six-day excursion to Manitoba’s northern port town. Snow geese are just for starters. Keep eyes to the skies for rare species like the Red Red Phalarope, Sabine’s Gull and Little Gull. Take guided field trips and spy Pacific loons, jaegers, willow ptarmigan and Smith’s longspur, among other avian favourites. Start planning your birding adventure today!